Every day from the 30th April to the 1th October, MATILDA II sets sail from the Marina at Villasimius at 10:30 am, getting you back for 4:30 pm. 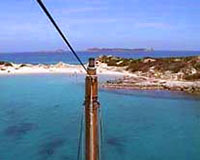 Assuming that there are no problems with the winds around the Gulf of Cagliari, the trip will be conducted by sail. It's a trip suitable for everyone. The schooner's speed and the attention to detail paid to the satisfaction of our customers. Not all the six hours are spent on board however. Usually we drop anchor twice in scheltered waters. Those who like, can use the 6-metre tender to have a swim or see the sights close up. The first stop is made at about 11:30 am when we reach the Isola dei Cavoli. After one hour spent on land, the crew serve lunch and, after a coffee and a sardinian liqueur, the trip continues until the second stop at a sheltered beach along the coast around Villasimius (we usually prefer to drop anchor at the Punta is Molentis). After a swim, we make our way back and arrive in port at 4:30 pm. Malloreddus alla campidanese (tipical sardinian pasta in a tomato and meat sauce). Sausage, cheese, tipical sardinian bread. Beverges (water, wine, coca-cola, coffee, Sardinian liqueurs). The contents of this site are copyright © 2008 SATMAR s.n.c. - All Rights Reserved.